LIMA - Paleontologists working in Peru have found a fossil from a bird that lived 10 million years ago, scientists said on Friday after returning from the dig site on the country's desert coast. The species of bird had a wingspan of 19.7 feet and fed mostly on fish from the Pacific Ocean. It first appeared 50 million years ago and was extinct about 2.5 million years ago because of climate change, paleontologist Mario Urbina of Peru's Natural History Museum said. Scientists discovered a rare fossil of the bird's head in Ocucaje, in the Ica region of Peru's southern coast, where an arid climate has preserved many fossils. "The cranium of the bird, from the Pelagornithidae family, is the most complete find of its kind in the world. Its fossil remains are hard to find," Urbina said. Old ocean seabeds in the area have been a treasure trove for fossil hunters. "This site had marine sediments. 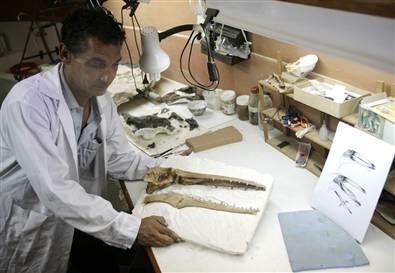 The fossil was found with other remains from whales, sharks and turtles," Urbina said. At the time of the bird's death, Peru's coast was hot and rainy, but millions of years later, it turned cool and dry, he said. The fossil is 15.7 inches long and will go on display on Saturday at the museum. The bird had some peculiar characteristics, including teeth at the tip of its beak and large wings that were less efficient than those of contemporary birds. "The teeth helped capture its prey. This was an animal that perhaps trapped its prey and chewed while it flew. It had a hard time taking off from the ground, and needed an elevated point to take off from," Urbina said.